Home » Hosting » Web Hosting » How do I change my file permissions? You can change the permissions on individual files, meaning you can choose who can read, write and execute your files. Scroll down to the Web Hosting section and click the Manage button. Scroll down to the Files section and click the File Manager button. From the File Manager, select the file you wish to change the permissions on and press the CHMOD icon. 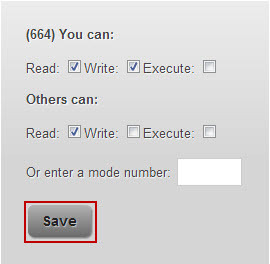 Here you will be able to change the permissions of your file, when you have made your changes press the Savebutton. How can I upload my website using the online file manager?